CollectingMagic.co.uk: Professor Hoffmann, the Father of the Modern Magic Book. Professor Hoffmann, the Father of the Modern Magic Book. Magic books are a huge part of my interest in magic, though I don't collect books in the same way as I collect props. I don't really seek out first editions and I'm happy with later reprints where original editions are expensive. As such I've not got an extensive collection of Hoffmann's books, but enough to give a rough outline of his conjuring career. Angelo John Louis worked as a lawyer and wrote a large number of books under the pseudonym of Professor Hoffmann. He felt being known as a magician would hinder his reputation, saying "I do not think that being known to dabble in magic would increase my professional prestige". The book that threw Hoffmann's name into magic history was his 1876 debut, Modern Magic. Above (left to right) are a 6th, 12th and 16th edition of Modern Magic. It was the first book in the English language to attempt to explain how to perform magic tricks, rather than simply exposing the secrets. Hoffmann attempted to cover all aspects of performance magic in 1876, using Ponsin and Robert-Houdin's French language writings as a base. Some of Hoffmann's translations were published off the back of Modern Magic's popularity. 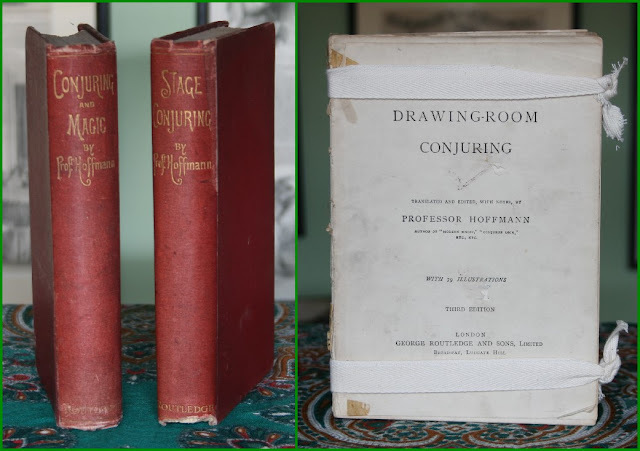 Below are the three published in Hoffmann's lifetime, Robert-Houdin's "Conjuring and Magic" and "Stage Conjuring" and L.P.'s "Drawing Room Conjuring". The above are all later editions and Drawing-Room Conjuring is in terrifically poor condition! These Robert-Houdin's were published in 1900 and by this time Hoffmann was in the highest regard as a magic author. As such Robert-Houdin was pushed off the spine in favour of Hoffmann. After these translations were first published, and fourteen years after Modern Magic, Hoffmann published the second in his series, More Magic. Above (left to right) are a 1st edition and an edition dated 1893. More Magic followed the pattern of Modern Magic covering tricks missed by the first book and including those invented in the interim. I tend to think of Hoffmann's core works as a trilogy, ending in Later Magic, though many include one or two more of his publications. The above are a 1935 and a rebound 1953 edition. Later Magic was first published much earlier, in 1903, and expanded in 1911. This was Hoffmann's last book to attempt to include all magic tricks up to date, though not Hoffmann's last magic book. Hoffmann attempted the follow up to Later Magic twice, his first attempt in 1911, though he felt it too brief to properly count as a member of the series. Complaining that his age and work pressures prevented him from writing a full follow up he published Magical Titbits, considerably shorter than his three preceding books. Latest Magic was published in 1918, a year before Hoffman's death. Hoffmann considered this the final in his series of four books (as mentioned, he excluded Titbits). It included many of his own tricks. Though a good book, it ignores the huge advancements made in magic since 1911, so doesn't really follow the pattern of the first three tomes. One can hardly blame Hoffmann though, he provided a solid catalogue of effects from the 19th century to 1911, by which time he was already seventy two. Hoffmann's writings on magic were serialised in boy's magazines throughout his career. They were also included in broader books written and edited by Hoffmann, or with Hoffmann as a contributor. On the left is an 1879 edition of Drawing Room Amusements by Hoffmann, which contains part of Modern Magic alongside sections on party games and other entertainments. 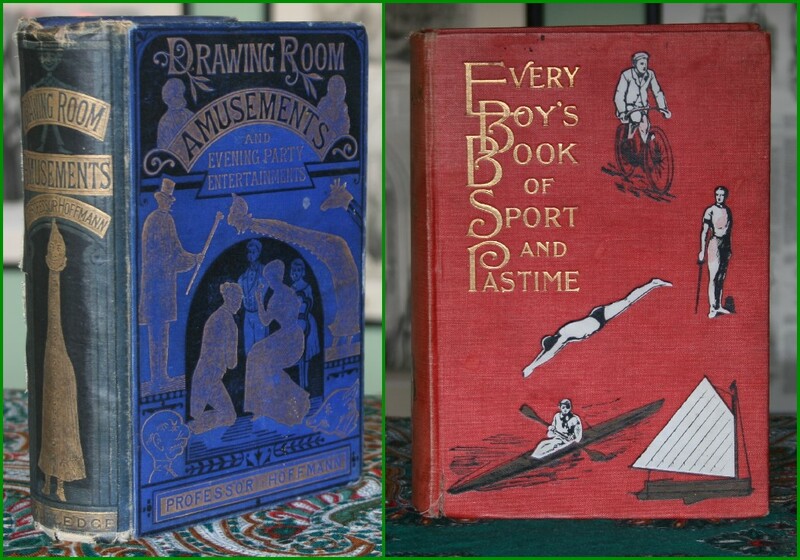 On the right is Every Boy's Book of Sport and Pastime, edited by Hoffmann, a 1911 2nd edition. This contains a huge amount of information on all sorts of topics, with a magic section made up of sections from all three of Hoffmann's main books. His books were also edited down and sold in cheaper, smaller formats, three of which are shown below. These three are undated, Card Tricks Without Apparatus and Conjuring Tricks with Coins, Watches, Rings and Handkerchiefs are both taken from Modern Magic. Tricks with Watches, Rings, Flags and Gloves is taken from Later Magic. Many variants of these books were printed, though I believe none of them included writing not found in Hoffmann's larger books. Hoffmann wrote a great amount on games and puzzles as well as magic. He even got the prestigious job of updating and expanding Hoyle's Games. Above is a 1907 edition of the hugely popular Illustrated Book of Patience Games, the illustrations for which are printed in black and red ink. 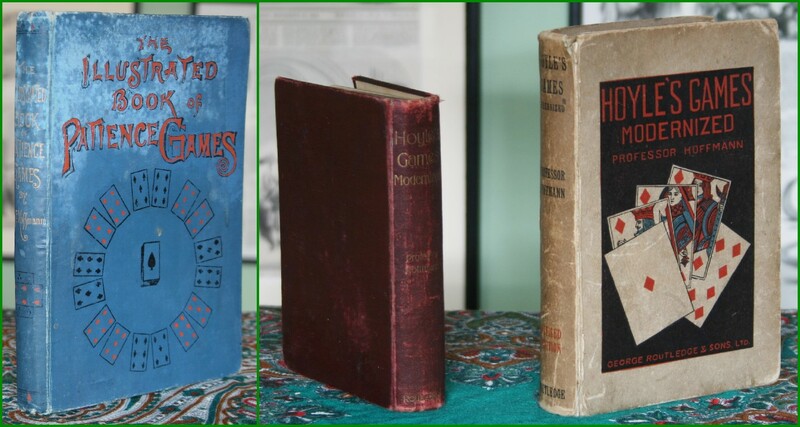 To the right are a 1903 and 1913 edition of Hoyle's Games Modernized, probably the most widely available book written by Hoffmann. The pride of my Hoffmann odds and sods is also the smallest. I didn't realise what I had when I bought it as part of a Gamages magic set. This little book, produced by Gamages, invented by Hoffmann, allows the magician to divine a card thought of by a spectator. My heart skipped a beat when I first opened it to find it was signed by Louis Hoffmann himself. As he wasn't a magician who performed professionally his signature is hard to come by, I really treasure it.